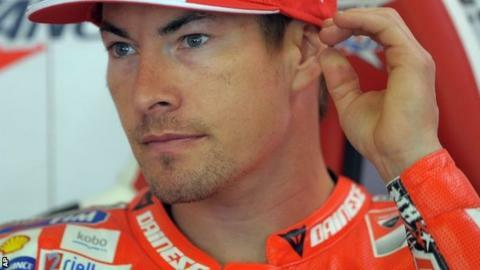 Nicky Hayden has confirmed that he will leave the factory Ducati MotoGP team at the end of the season. American Hayden, 31, won the world championship for Repsol Honda in 2006 but has managed just three podium finishes in five years for Ducati. "I'm not coming back to Ducati in MotoGP next year," he said. "I'm not really sure what I'm going to do. I've got some options that are interesting." Britain's Cal Crutchlow has been linked with taking his place at Ducati. Crutchlow currently rides for the Tech 3 Yamaha team but wants a move to a full factory team for 2014 and is in negotiations with Ducati, Yamaha and Honda.